Follow Yana as she discovers The City of Logan. 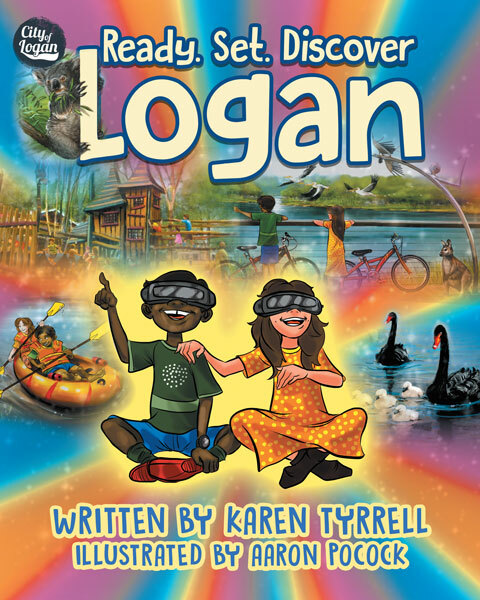 This is a light-hearted picture book telling the story of Yana who has moved from her country and surrounding she knows so well, to a new country, Australia. Yana feels alone, everything is different, but with the help of Bunji, a local Indigenous boy Yana is taken on a tour of discovery. This tour highlights the many meeting places in The City of Logan, South of Queensland, bringing with it a better understanding of the rich Nature Reserves and cultural experiences available within the community. The essence of this book is about community, and the underlying message is one of friendship, acceptance, and merging of cultures. This story is aligned with Harmony Day, sponsored by The Logan City Council and winner of Art Queensland Grant. It also recognises the First People of Australia and invites readers, particularly newcomers, to discover a new land, a new home, to enable them the feeling of belonging. Among other places, Yana explores Logan City Library, Riverdale Park, and Chung Tian Temple. Karen Tyrrell has created an avenue to help children adjust to what can be a difficult time, while Aaron Pocock has enhanced the story with a palette of inviting colours and delightful illustrations that would suit 6 – 8 year olds.